History: Shunran is one of four siblings trying to resurrect the leader of the Cat Family. Her powers include being able to cast illusions, and her three other siblings are Shuuran, Karan, and Touran. Shunran tries to get revenge on what the sons of the dog general did to the panther king. 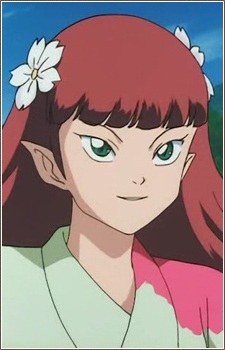 She shows up with other panthers around the time when InuYasha was sealed to a tree. Fifty years later, the panther tribe returns for the priestess who has the jewel shards, Kagome. While the other three panthers capture her, Toran challenges Sesshomaru to a battle at a castle that the panther tribe took over and placed a barrier. Eventually, as the moon went over their master's corpse, she gathers the villagers, Kagome, Miroku, Sango, and the sacred jewel shards in front of their master. The dog general's sons show up, and as the panther king is asking for souls, he kills Shuran and Karan. After the panther king is killed again, the other panther divas come back to life by Sesshomaru's sword, and the panther tribe returns to where they lived.